BRUSSELS, December 4. /TASS/. During NATO Foreign Ministers’ Session, Ukraine proposed to ban Russian vessels from entering other countries’ ports, Ukrainian Foreign Minister Pavel Klimkin stated on Tuesday during a press briefing in Brussels on the outcomes of the meeting of the North Atlantic Council with Georgian and Ukrainian foreign ministers. "We have also discussed the need to put an end to the Nord Stream 2, and that it would be the most suitable sanction for Russia. Also, we talked about the possibility of banning Russian vessels from civilized countries’ ports," the Ukrainian top diplomat stated. Klimkin added that this initiative remains under discussion. "How this discussion will proceed depends on our future talks," the minister said. During the meeting, NATO Secretary General Jens Stoltenberg stated that NATO would continue to increase its presence in the Black Sea due to the "aggressive actions" of the Russian Federation. "Four years ago, Russia illegally annexed Crimea," Stoltenberg said. "Now, Russia is attempting to use Crimea to expand its influence. And control the Sea of Azov," he added. "We call on Russia to immediately release the Ukrainian sailors and ships it seized. Russia must allow freedom of navigation," Stoltenberg continued. "In response to Russia’s aggressive actions, NATO has substantially increased its presence in the Black Sea region over the past few years. At sea, in the air and on the ground," he stressed. Stoltenberg mentioned that NATO vessels routinely patrol the Black Sea, spending 120 days in the Black Sea in 2018, compared to last year’s 80 days. "There is already a lot of NATO in the Black Sea. 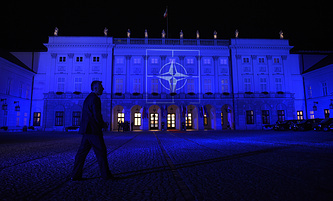 And we will continue to assess our presence in the region," the NATO secretary general concluded. On November 27, Ukraine’s parliament, the Verkhovna Rada, endorsed President Pyotr Poroshenko’s decree on imposing a 30-day martial law from November 28 in the Vinnitsa, Lugansk, Nikolayevsk, Odessa, Sumy, Kharkov, Chernigov, Donetsk, Zaporozhye and Kherson regions, as well as Ukraine’s territorial waters in the Sea of Azov. Initially, Poroshenko sought to impose martial law for 60 days, but this put into question holding the March presidential election and sparked a public outcry. Despite the repeated warnings and demands to stop, the Ukrainian vessels continued their way, forcing Russia to use weapons. All three Ukrainian ships were detained in the Black Sea. Three Ukrainian servicemen were slightly wounded and received medical assistance, and their lives are not under threat. A criminal case has been launched over the violation of Russia’s state border. Moscow slammed the incident as a provocation. Twenty-four Ukrainian sailors have been detained in Russia until January 25, 2019.